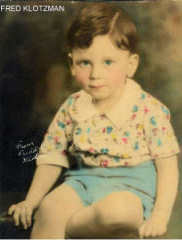 Fred Klotzman is the son of Mary Klausner and her husband Issie Klotzman, and a grandson of Sam and Minnie Klausner. I was drafted into the Army right out of high school, into the Signal Corps after infantry basic training, and promoted to Sergeant, teaching photography in the USA. 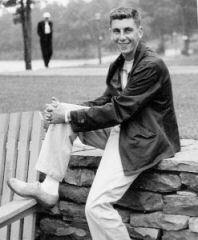 After my discharge from the Army I went to Cornell University in Ithaca, NY on the GI Bill and graduated June 1951. My major was in engineering but that was then a five-year degree, so I graduated in four years with a Psychology degree. Later I would take more engineering courses at Fenn College (now CSU) to be able to earn my registration as a Professional Engineer. 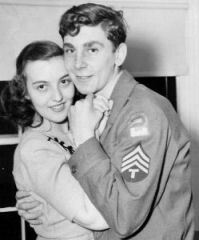 On June 17, 1951 I married Judy Vision, my Glenville High School sweetheart (and the best Spin-The-Bottle kisser at a "sweet 16" party). We are both active in the Glenville High School Alumni. 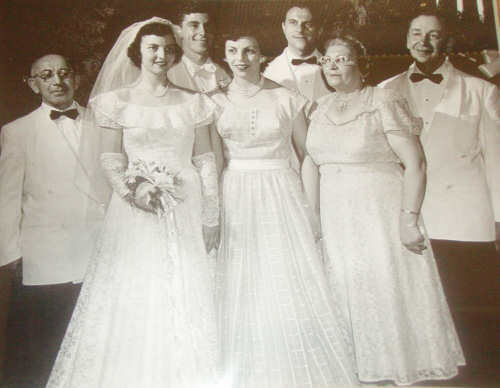 (l - r) Daniel Vision (Judy's father), Judy Vision Klotzman (bride), Fred Klotzman (groom), Edna Vision Stein (Judy's older sister/maid of honor), Marv Yelsky (Fred's brother in law/ Ruth Klotzman Yelsky's husband/best man), Mary Klausner Klotzman (mother of the groom), Issie Klotzman (father of the groom). For two years after college I worked for the Roseman Structural Iron Works. Then I went to The Sanford Construction Company, where I estimated and supervised commercial, industrial, and public construction projects until 1956. I then went on my own and started The Klotzman Construction Company, building the same kind of projects, successfully - more than 100 large contracts, all in the greater Cleveland area. In 1959, I became an Ohio Professional Engineer by passing the state boards. With an Ohio architect we started designing, building, owning, and operating successful industrial parks, culminating with Alpha Park in Highland Heights and Neo Park in Garfield Heights." In the early 1990s Fred would turn the management of these properties over to his sons Kerry and Bruce. In 1951, immediately after their marriage, Fred and Judy moved to what Fred now describes as "the third floor of a two family home" on Tuscora Avenue, in Glenville, near the Tetiever synagogue. Their first child, David, would be born there a year later. In 1955 Fred and Judy moved to a house Fred designed and built on Lander Road in Mayfield Heights. Their second and third sons, Kerry (1955) and Bruce (1957), would be born there. They lived in that home for 34 years. In 1989 Fred and Judy moved to Bentleyville, next to Solon, which in recent years has seen the arrival of many Jewish families. Fred designed the house which used all-steel construction. Fred grew up and became Bar Mitzvah in the Orthodox Tetiever synagogue on Linn Drive in Glenville, where his father and grandfather were long-time members. He remembers his grandfather Sam Klausner, a leader of the congregation, seated on the bimah during High Holy Day services. In 1947 Cleveland had only two Reform congregations, "Silver's" (Tifereth Israel) in University Circle and "Bricker's" (Anshe Chesed) on Euclid Avenue and East 82nd, known as "The Euclid Avenue Temple". Two of the nation's largest synagogues, they saw that there was a need for another congregation located in the suburbs, where many young, unaffiliated Jewish families were moving after World War II. They worked with the national Reform movement to start Temple Emanu El, and chose a Cleveland native, Rabbi Alan S Green, to lead it. In just two years Emanu El would have 500 member families. In 1963, attracted by Rabbi Green's intellect and character, Fred and Judy joined Temple Emanu El and have been active members ever since. Their three sons would be Bar Mitzvah there. 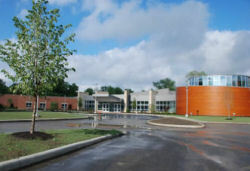 In July 2008 Temple Emanu El moved from Green Road near Cedar Road, in Beachwood, to a new building in Orange Village. Fred played a large role in his temple's move. 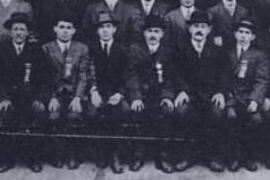 1914: Grandfather Sam Klausner (fourth from left and wearing a ribbon) sits proudly at the dedication of the Orthodox Tetiever congregation's first building, on East 40th Street, just north of Woodland Avenue. 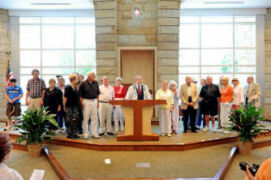 2008: Grandson Fred Klotzman and wife Judy stand proudly with past presidents and other leaders on the bimah of Reform congregation Temple Emanu El during its first service in Orange Village. Cindy Chang in the first wedding in the new home of Temple Emanu El. Continue to a Klausner Family Scrapbook.